Travelers are always short of time and money when travelling abroad. And whatever they have, they want to see more and more wasting no time. While travelling by air is rather expensive, trains and buses are generally preferred for being cheap, though more time consuming. 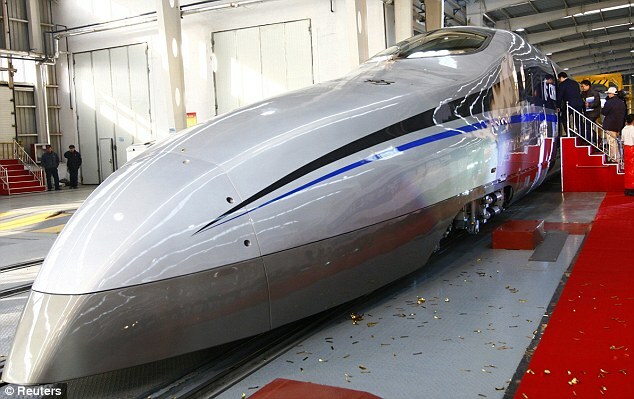 But perhaps not anymore, specially in China, where travelers can now move faster in a super-rapid-test train that can speed up to 300 miles per hour - 100mph faster than the current record-holder. The train, made from plastic materials reinforced with carbon fibre, is designed to resemble an ancient Chinese sword and 'will provide useful reference for current high-speed railway operations', according to train expert Shen Zhiyun. Earlier this year, China unveiled its fastest operational locomotive which was able to cover the 824-mile trip between Beijing and Shanghai in five hours - reaching record-breaking top speed of 200mph and maintaining an average speed of 165mph.